Some posts can be scheduled, and some should go up the instant you write them. When I first saw this photo (last Thursday? Friday?) it gave me that feeling. I think it was the little t-shirt. But at the moment I'm so glad not to have a baby crying in my house. I do enough to thwart my own productivity. I schedule everything personal, to give me time to think it through. Most get pulled. Whiny is not hot (me not you). I've been feeling very no baby lately for the first time EVER. Scary weird. 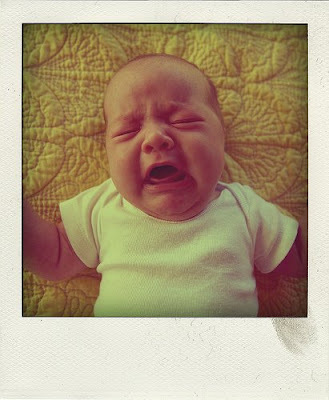 It is the way babies only know how to communicate through crying that really gets me over to the non-baby camp. and that whole birthing thing. my sister's bladder was moved. to somewhere else. in her body. this is the picture that gives you "that" feeling? for real? oh i believe there may be no turning back for you. but the little t-shirt is cute. There are only two sounds in the world that make me want to throw myself through a 3rd story window. 1. the sound of my mom clearing her throat (she calls it nasal drip, I call it too many b*** hits). Until I learn to find the latter endearing, it's kid-free for me (much to Nick's dismay). Though I can totally envision the morph from East Side Bride into East Side Mom. Don't they make baby doc martens? Amanda, that thought is almost enough to make me get my tubes tied right now.